Replacement shaft for Maytech 2830 series motors. Diameter 1/8", 3.17mm or 3.2mm (whatever you want to call it). 45mm length with snap ring groove at one tip. 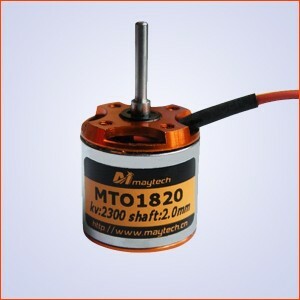 1820 motor has small weight, is designed specifically for indoor ultra-light acrobatic models (F3P). 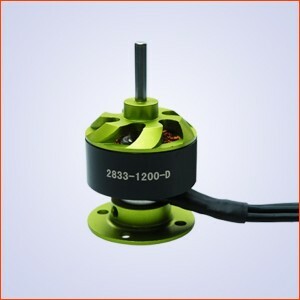 Two oversize and high quality ball bearings fix the rotor, which ensures its long life and excellent balance. The motor comes with a complete set of propeller mount accessories, as well as the perfect packaging to protect the motor and its accessories. Actual KV here measured in our shop is 1207. Motors like this mostly commonly used 3S for sport ship range where moderate to high pitch speeds are required. 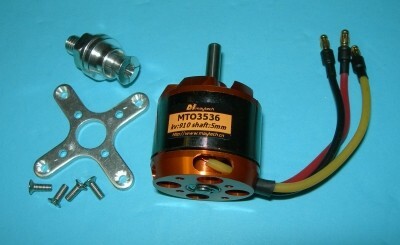 A motor like this is perfect for many aircraft and commonly used on models from 16-32 oz. A good motor on our Stick 400 and other similar kits. Replacement shaft for Maytech 2836 series motors. Diameter 1/8", 3.17mm or 3.2mm (whatever you want to call it). 49mm length with snap ring groove at one tip. Replacement shaft for Maytech 6362 series motors. Diameter 8mm. 87.5mm length. Snap ring groove at 2mm and 24.75mm in from one end. Useful for many motors requiring a 8mm shaft. Replacement shaft for Maytech 3530 series motors. Diameter 5mm. 47.5mm length. Snap ring groove at 1mm in from one end. Useful for many motors requiring a 5mm shaft. Replacement shaft for Maytech 3442 series motors. Diameter 5mm. 59.5mm length. Snap ring groove at 1mm in from one end. Useful for many motors requiring a 5mm shaft. Replacement shaft for Maytech 5055 series motors. Diameter 5mm. 67.5mm length. Snap ring groove at 2mm and 19mm in from one end. Useful for many motors requiring a 5mm shaft. Replacement shaft for Maytech 5055 series motors. Diameter 6mm. 72.5mm length. Snap ring groove at 2mm and 19mm in from one end. Useful for many motors requiring a 6mm shaft. 1000kv motors in this size are some of the most useful motor spec's available across a wide range of park flyers. 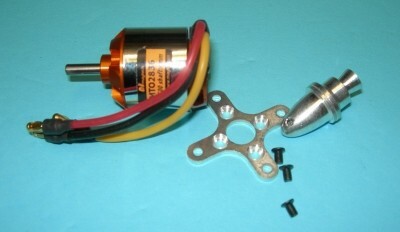 A motor like this is perfect for many aircraft and commonly used on models from 16-32 oz. The lighter the more high performance, the larger the more floaty. Estimates based on manufacturers provided constants using E-Calc. High Quality 1300mah used as trial cell in calculations. Actual performance may vary depending on components used, accuracy of data as provided by manufacturer, quality of ESC, weather and many other variables. The motor comes with a complete set of propeller mount accessories, as well as the perfect packaging to protect the motor and its accessories. Mount your motor with the included screws tightly on your front cover of model. Our motors provide high efficiency stator design. Small size, lightweight and long life. Please make sure your motor has enough cooling while running. Our motors providing best performance with the recommended propeller size. If you consider changing the propeller size, please be aware that motor be overheat and damaged. Keep motors away from moisture, dust, scrap and small items to avoid damages. Usefull for models .10 through .30 size. A compact 3.6 ounce package with plenty of punch. Range of setups provided below to fit many needs.